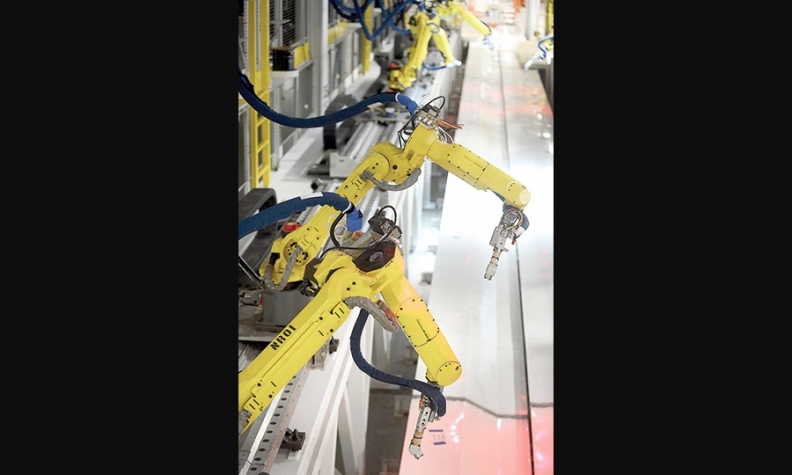 Robotic painting arms are tested in the paint shop scheduled to open next year at Chrysler's Sterling Heights Assembly Plant. DETROIT -- The merging of Chrysler and Fiat manufacturing systems will take a step forward early next year when a 935,000-square-foot paint shop opens at Chrysler's Sterling Heights Assembly Plant in suburban Detroit. Chrysler spokesman Gualberto Ranieri said the shop will be nearly identical to those that Fiat uses globally. "There is no Berlin Wall that divides the company," he said. The common paint system at Chrysler and Fiat plants will reduce manufacturing complexity and add flexibility for quick model changes. The paint shop, part of a $1.1 billion investment Chrysler is making in its Detroit plants, will be able to handle 998 vehicles per day on two shifts. It uses 112 Fanuc robots. The painting sequence goes like this: First, e-coat, the substance that enables primer and paint to stick to metal, is applied. Then comes a rust preventative. That's followed by the powder-coat primer. And, finally, two coats of paint: the base coat, which contains the color, and the clear coat. Chrysler is spending about $850 million on the shop, which is in a new building on the grounds of the Sterling Heights plant. Two enclosed overhead conveyors connect the shop to the main production line. Reporters were given a preview in July, weeks before the first test vehicles were scheduled to roll down the line. Chrysler expects the shop to be operating in the first quarter of 2014. It will replace a shop that dates to 1980 when Volkswagen of America owned the plant and built the shop. The new paint shop has been designed to eliminate contamination, require minimum maintenance and provide maximum production flexibility, said John Powell, Chrysler's senior manager for paint facilities, planning and launch. To eliminate contamination, 95 percent of the air is recycled, instead of being sucked in from outside and treated. Maintenance is reduced in several ways. When a robot has to be cleaned or repaired, the robot to the right or left can take over. The conveyor belts that move the car bodies use friction drive, a system with a series of motors and rubber wheels. Older style systems use chains. The line itself snakes eight miles through the plant and runs quietly. Unlike older style conveyors, it requires no grease or oil. Chrysler has not confirmed vehicles for the plant yet. But it is widely expected that the next-generation Chrysler 200 and possibly an Alfa Romeo vehicle will be assembled and painted there.